← Crisis in dispute resolution: are we being excluded from the world's most important discussions? Throughout the world, courthouses tower above the street in busy urban centers or stand with quiet dignity in town squares. 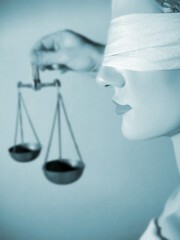 Blindfolded Justice waits close by, her sword unsheathed as she lifts her scales. What do these depictions of Justice say about democracy and law? What messages do the stone or concrete buildings themselves convey about adjudication and human rights? What elements are lost or missing from 21st century representations of justice and the law? This Lecture provides a multi-century, cross-cultural visual narrative of both continuity and change in the use of adjudication by governments seeking to legitimate their authority to impose their law through judges. From the story of the Judgment of Solomon to the Town Halls of Siena and Amsterdam, one can find examples of adjudication, a task of governance that predates democracy. From those walls and the allegories that they represent, one can learn how adjudicatory practices contributed to democratic ideology by generating norms that decisionmakers not be corrupted by payments from one side, that their decisions be predicated on information rather than be arbitrary, and that they hear both sides (audi alterum partem). Despite the cutting-edge construction techniques and abstract paintings, many new courthouses, centered on their courtrooms, are both old fashioned and dysfunctional. Even more troubling, one might read the buildings as gestures seeking to instill a sense of legitimacy to state-based processes by making it seem as if trials were a major modality and thereby rendering the predominance of the alternatives to trial less visible. From a more positive vantage point (if you are, as we are, skeptical of some forms of alternative dispute resolution), one could interpret the ongoing building as evidence of the deep ambivalence that government leaders have about their own promotion of settlement and privatization in lieu of public processes. This exhaustively researched lecture invites readers to remove the blindfold from their own eyes and judge the courthouse and depictions of Justice anew. This entry was posted in Global and Cultural Awareness, Lawyers, Law and Justice. Bookmark the permalink.